Let us take care of your year-end celebrations! 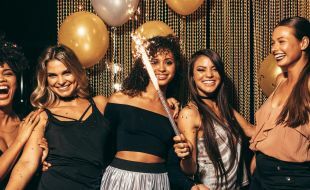 It’s been a busy year, and just when you’re ready to start winding down for the festive season, there’s the all-important company year-end function to consider. Tsogo Sun is here to make planning and executing the perfect send-off for 2018 easier. Simply select one of our participating Tsogo Sun outlets to host your 2018 year-end function, and we’ll take care of the details. With a variety of venues and restaurants to choose from, you’re spoilt for choice when selecting the right venue. And with our experienced event planners at your side, you’re free to raise a glass and celebrate with your team. Southern Sun Elangeni & Maharani - Spoil yourselves with decadent food in a stunning setting. Golden Horse Casino - It’s never too early to start booking your year-end party! Riverside Sun - Escape to the Vaal and enjoy these year-end packages. Southern Sun Emnotweni - It’s time to think about where your office party is going to take place. The Ridge Casino - Enjoy a great meal with family or friends and excellent value at Billy G Restaurant. Garden Court Polokwane - Celebrate the successes of the year.